Celebration time on the Wildcats’ bench at the final whistle on Saturday night. Photo: Noel Browne. 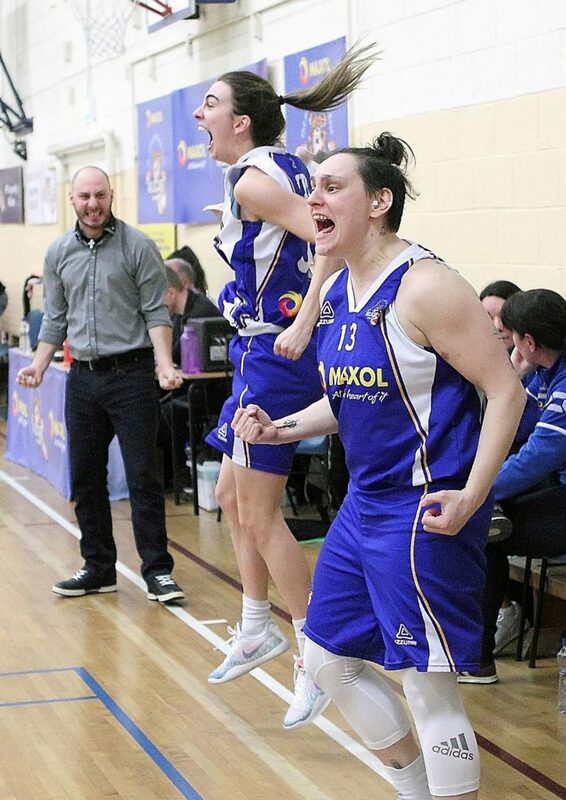 Maxol WIT Wildcats got back to winning ways on Saturday night last when they overcame a stern challenge from Killester Dublin in a pulsating thriller at the Mercy sports hall. The final buzzer and score of 70 points to 65 in favour of Wildcats was greeted with a thunderous reception by both players and supporters alike as for long periods in this game all indications were that Killester would take the spoils once again. The Dubliners have been Wildcats’ bogey team for some time and have been victorious both home and away for the past three years. Five minutes into the game the sides were level on 10 points each but by the end of the quarter Killester had forged ahead to lead 21-15 and deservedly so as their defence was so solid Wildcats found it difficult to get a shot off. By the halfway stage, Wildcats had clawed back a nine point deficit to three thanks to the efforts of team captain Sinead Deegan plus Steph O’Shea and Jazz Walker. All three had exceptional performances and kept Wildcats’ hopes alive. Indeed had it not been for many difficult periods when Wildcats players threw long range passes out of the playing area and had endless short passes intercepted by their opponents, things would have been much different. Trailing 34-31 at the break didn’t seem so bad considering their generosity to Killester. As the game progressed, the turnovers continued with the Dubliners extending their advantage to 10 points. Midway through the third quarter one could see Wildcats were at last getting their game together and kept Killester scoreless for a spell while netting some fine baskets themselves. Just then Wildcats’ Meibh Maher had what appeared a clear cut block but the referee called a foul. This incident proved to be a turning point as the home supporters showed their disapproval in the noisiest way possible. Their reaction and encouragement from then to the final buzzer was simply sensational as Wildcats lifted their game to another level. Every score, and there was some magnificent ones for Wildcats, the supporters lifted the roof off. The combination of Steph O’Shea and Cathy Kavanagh inside were unstoppable as was the always reliable Jazz Walker. But the scores that rocked the sports hall came from American Alyssa Velles who hit three three pointers as part of an 18 point total in the final 15 minutes. Meanwhile Killester were not going away and hung in with many fine scores from American Christa Reed (20 points). Into the last minute of the game and Wildcats led by five. Moments later their advantage was just two points. Coach Dimitris Zacharias took a time out for Wildcats to settle his troops. Then Killester took a time out to set up a game saving play which rimmed out. Steph O’Shea rebounded and outlet to Velles who drove to score and in doing so was fouled. Her bonus shot was perfect and once again the Mercy sports hall roof lifted as Wildcats supporters knew time was up and a victory was theirs. Credit to all involved who played their part in what was a very special sports occasion and a pleasure to have witnessed. Top scorers for Wildcats: Allysa Velles 18, Jazz Walker 17, Steph O’ Shea 15. This weekend is one of the biggest in the sporting calendar of Irish Basketball as its National Cup finals weekend with finals in both codes and several grades happening from Friday though to Sunday in the National Basketball Arena Dublin. All teams involved will be fine tuned in an effort to take home one of the most coveted trophies in the game. For the first time in many years Wildcats are on the big stage in the U-18 cup final against Liffey Celtics who will carry the favourites tag. These two teams met back in November in a tournament in Belfast and the Kildare side snatched victory in the last second to win by a single point. Coach Tommy O’ Mahony will have digested the memories of that game and will have his team well prepared for what is expected to be one of the highlights of the weekend. The time of the event 10am this Saturday means an early start for supporters. The team will stay in Dublin the night before so as to be well rested and prepared for the big occasion. WILDCATS SQUAD: Abby Flynn, Robyn Morrisey, Bami Alukayode, Debbie Ogayemi, Eva Daniels, Kate Hickey, Ciara Butler, Megan Waring. Anna Grogan and Grace O’Brien.